This web platform about organic production is systematically structured into different types of plant production, which is subdivided into various arable crop types – cereals, grain legumes, oil crops, tubers, intercrops and fodder crops - and other crop production. The clearly arranged platform provides a broad, easy to find knowledge with some ready-to use and step-by-step recommendations i.e. correct seedbed preparation, sowing time and density for legumes and so on. 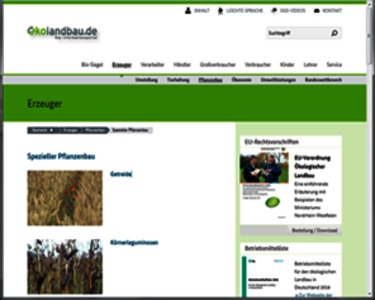 The user can find habitat and soil requirements, pest, disease and weed control and harvest are described for a successful crop-specific production. Additional information is free for download in each section, as the EU-legislation and the input list. The quality of a sections` content can be furthermore rated by the user.